It's scientifically designed to support: 1. All-day energy & vitality, 2. Healthy hair & nails, 3. Memory & concentration, 4. Healthy vision, 5. Fights skin aging, 6. Healthy bones & muscles and 7. Immunity. Our experts have developed this unique blend of essential multivitamins and minerals which bring together 7 key benefits specifically for today's woman. In today's world, everyone does many things to look youthful and feel energetic, from the outside. But, do you do enough to nourish yourself from the inside? At Seven Seas, we understand the importance of both. Our experts have developed Perfect7 Woman, which brings together 7 key benefits specifically for today's woman. Its scientific combination is enriched with a range of nutrients that nourish your body and meet its key needed. 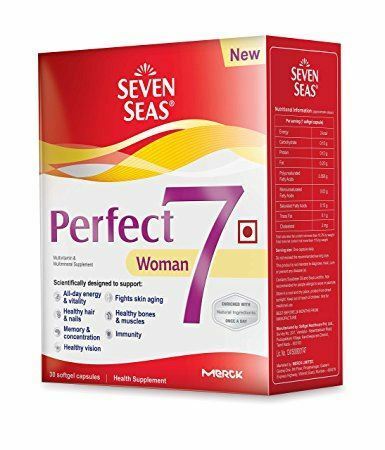 Seven Seas Perfect7 Woman is designed to support: 1. All day energy & vitality - Vitamin B1, Vitamin B2, Vitamin B3, Vitamin B6, Vitamin B12, Pantothenic Acid, Vitamin C, Folate, Iron, and Magnesium help reduce fatigue and tiredness. 2. Fights skin aging - Resveratrol helps to fight skin aging with its antioxidant activity and by scavenging free radicals which are responsible for skin aging. 3. Healthy hair & nails - Vitamin B1, Vitamin B3, Vitamin B6, Vitamin B12, Vitamin C, Vitamin E, Biotin, Copper, Selenium, and Zinc help maintain healthy hair and nails. 4. Healthy bones & muscles - Vitamin D3, Magnesium, Zinc and Manganese help support healthy bones and muscles. 5. Memory & concentration - Folic Acid, Biotin, Pantothenic Acid, Iron, and Zinc contribute to normal mental performance and normal cognitive function 6. Immunity - Vitamin C, Vitamin D3, Copper, and Selenium contribute to the normal function of the immune system. 7. Healthy vision - Vitamin B2 contributes to the maintenance of normal vision.